The Effleur Cosmetic Case range is the epitome of style, offered to you at a sensible price. They are the choice of Professional Beautician and Makeup Artists, and are without doubt the most glamorous tool of the trade! This sleek Portable Cosmetic Makeup Trolley has multiple dividers, removable trays and compartments to offer space for your cosmetic brush sets, nail polishes, makeup kits and other beauty accessories. Stay secured as it comes with easy close latches and two lock keys to keep your belongings in place at all times. 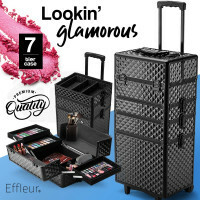 With super strong aluminium hinges, clips and frame, you will surely get the best value for your money with this makeup case! Excellent product. Very happy with purchase. Arrived. Really good quality. Thank you. Great communication, fast delivery. Highly recommend.